As they unveil their first new album in five years, Tonight, Tomorrow and Yesterday, the across-the-board praise from critics proclaims roots-music troubadours Donna the Buffalo have skillfully assembled a fine set that bolsters their longtime status as a celebrated, exceptionally talented mainstay in Americana music. Released, June 18, Tonight, Tomorrow and Yesterday finds Donna the Buffalo more energized and focused than ever before in their near 25-year career. The follow up to 2008’s acclaimed Silverlined, which reached the Top 10 on the Americana charts, Tonight, Tomorrow and Yesterday—the group’s 10th studio album—proves the band as a consistent steward of Americana music, their signature sound—traditional mountain music infused with elements of Cajun, rock, folk, reggae and country—an eclectic and extraordinary melting pot of such. The music video for “I Love My Tribe” enjoyed an exclusive premiere on CMT Edge. 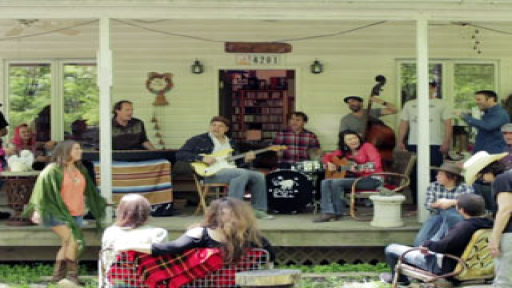 Watch the video filmed in and around Nashville – and featuring a cameo from Jim Lauderdale – here! In its first week at Americana radio, the album was No. 2 Most Added. In its second week, the it debuted in the Top 20 on the Americana radio chart, and this week the album catapulted to No. 12. 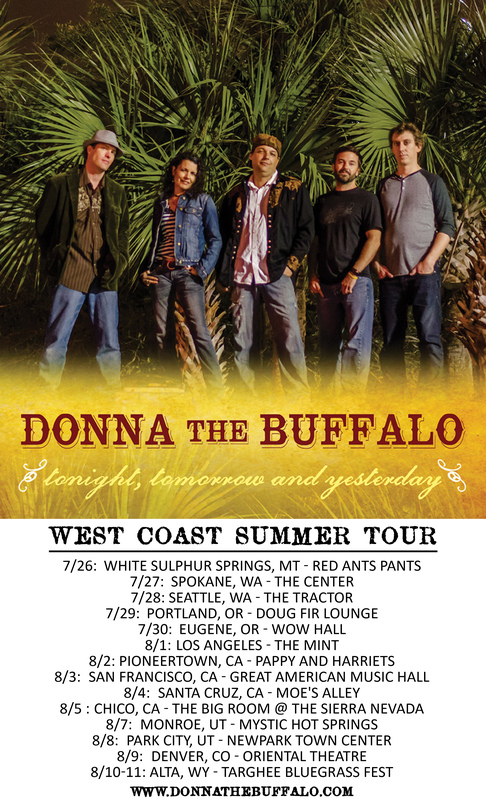 In support of the new album, Donna the Buffalo has a hefty tour lined up for the summer season, which includes a few weeks on the West Coast. They kick things off at the Red Ants Pants Festival in Montana on July 26 and travel throughout the Northwest before heading for shows at the Mint in Los Angeles and Pappy and Harriet’s in Pioneertown, CA. Saturday, August 8 marks the band’s return to The Great American Music Hall in San Francisco, followed by shows in Santa Cruz, Chico and then Utah for appearances in Monroe and Park City. They then perform in Denver before wrapping the tour at Wyoming’s Grand Targhee Bluegrass Festival. 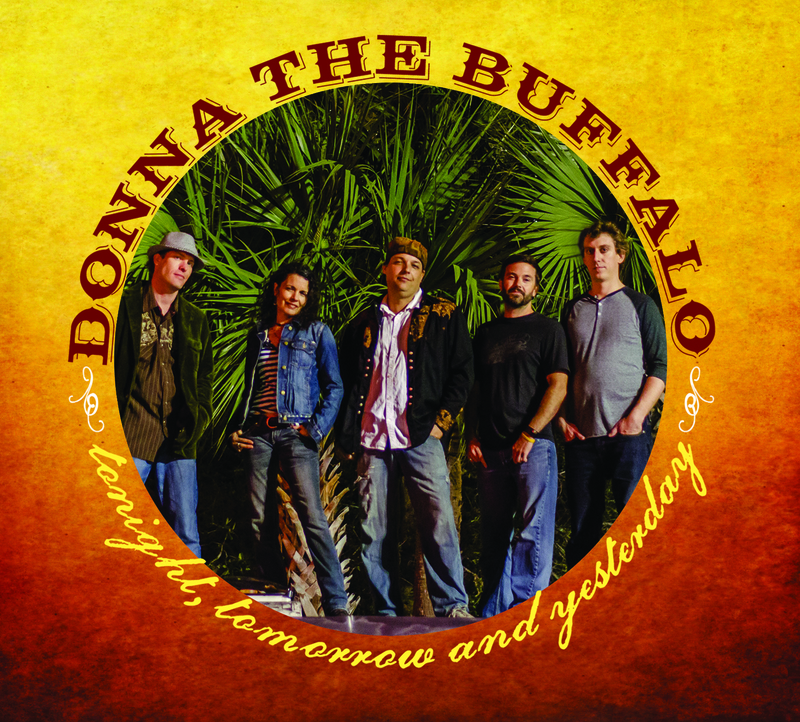 The most up-to-date touring information can be found at www.donnathebuffalo.com/tour-dates. Throughout its career the band has traveled millions of miles and spent nearly a quarter of a century performing at the country’s most prestigious festivals and clubs. Their fervent fan base, nicknamed The Herd, follows the band with zeal and has created a unique and supportive community online and at DTB shows across the nation. As an extension of this community and the band’s own dedication to live roots music, Donna the Buffalo started its own annual event—The Finger Lakes GrassRoots Festival of Music and Dance—20 years ago in upstate New York, which draws more than 15,000 people every year, and have since added to the GrassRoots festival family with Shakori Hills in NC and the Virginia Key GrassRoots Festival in Florida. On June 18, 2013, the band released its 10th studio album, Tonight, Tomorrow and Yesterday, via Sugar Hill Records. Leftover Salmon is pleased to announce their 2013 Fall Tour! The band will be traveling throughout the northeast starting this September with stops in Morgantown, Philadelphia, Providence, Boston, Portland, Burlington, Brooklyn and a special show presented by Relix at the Capitol Theater in Port Chester NY before heading over to The Fresh Grass Bluegrass Festival in Massachusetts. Towards the end of October, LoS will be heading down south starting in Arkansas and another appearance on the esteemed Nashville’s Music City Roots radio show before looping through the southeast – Atlanta, Charlotte, Wilmington, two nights in Charleston, and Carborro – and and back up north again to Washington DC and Richmond. The band lands in the midwest for several shows to close out the tour with shows in Ann Arbor, Des Moines, Madison, Chicago and Lincoln. LoS Fan Club ticketing will go on-sale Thursday, June 20th. Stay tuned for further dates and other refreshing Leftover Salmon summer news to be announced. Be sure to tune in to LiveSalmon.com for LIVE-streams of all shows (provided there is access to an Internet connection) and downloads of live performances within a few days of the show. Town Mountain is Robert Greer on vocals & guitar, Jesse Langlais on banjo and vocals, Phil Barker on mandolin & vocals, Bobby Britt on fiddle, & Jake Hopping on upright bass. Photo by Jason Beverly. This video is the first installment of the new “Town Mountain Covers Series” hosted by The Bluegrass Situation. They’ll do two or three more cover songs of their choice and then let the audience chime in with suggestions on what cover song they would like to hear Town Mountain do. Stay tuned to The Bluegrass Situation for more details as the festival season unfolds! “I’m On Fire,” is a song that has been in Town Mountain’s repertoire for years and was recorded on their 2008 album Heroes & Heretics; the band has continued to play and develop their version at live shows. After a nice mention about their version of the “I’m On Fire” in Pop Matters  and a shout out from Dale Earnhardt Jr to check out the song when he took over the National Guard’s twitter account in November of 2012, it has resurfaced into the public eye. A YouTube video with the track, which simply shows Heroes & Heretics’s album cover, has garnered 100,000+ views. We are happy to present an official backstage video of the band performing the song. “They pick and sing with a passion you don’t find much these days, it’s refreshing and real good. Put the cd in the truck, hit the parkway or some other good riding road, roll the windows down, and play it loud. PS. Watch out for the lawdog,” says John Roten of WPEK/WMXF. Town Mountain is chasin’ the horizon this summer and heading to a town near you from the east to the west, from the deep south to close to the Canadian border. 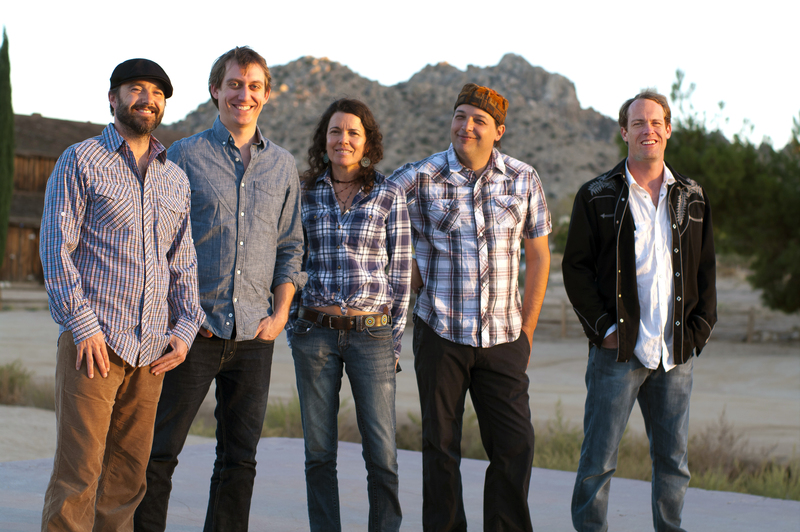 For more information about Town Mountain and their current tour dates, please visit TownMountain.net and facebook.com/TownMountain. “Next time Donna the Buffalo throws a house party, I definitely want to go. 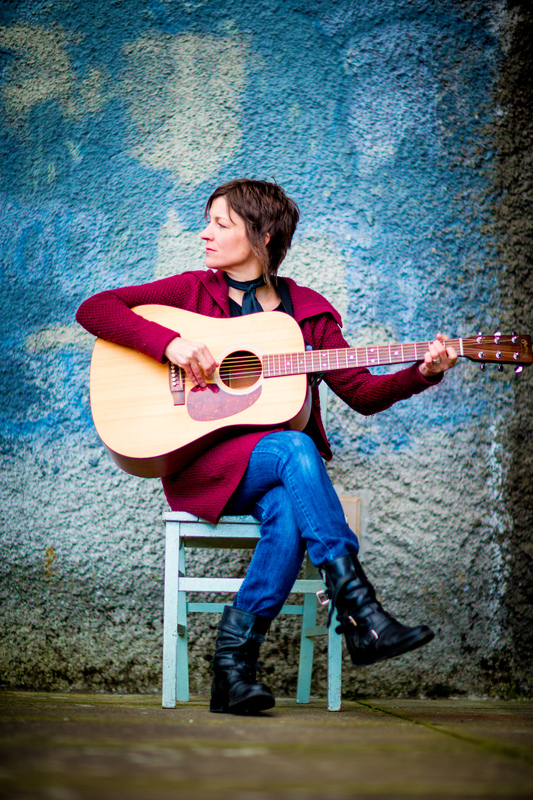 When the folk-inspired melody of “I Love My Tribe” begins, singer-songwriter Tara Nevins is sweeping off her front porch and trying to get a heartbreak off her mind. But before long, she tosses the broom aside and offers this happy ode to breaking free — and breaking the mold. Later, when she’s singing at the farm and surrounded by her circle of friends, it feels like one big group hug,” writes Craig Shelburne with CMT Edge.